What was supposed to be a formal function for release of a newsletter of the Supreme Court bar Association on Tuesday (January 30), a bonus for everybody was a possible sign of melting ice between Chief Justice Dipak Misra and the four “rebel” judges. In the programme Justice Kurian Joseph and Justice Madan B Lokur, two of the rebels (the others being Justices J Chelameswar, Ranjan Gogoi) were present and also met CJI. However, Justices Chelameswar and Gogoi, the two senior-most, did not attend the function). It was a good sign that the judges of the apex court showed solidarity, what with top hawks of the executive also present at the function. While going for the function Justice Joseph said that “the Supreme Court is one”. This statement of unity was not wasted. Present on the occasion was Law Minister Ravi Shankar Prasad, who used the opportunity to advocate a cross-country debate on simultaneous elections. The CJI launched the newsletter. 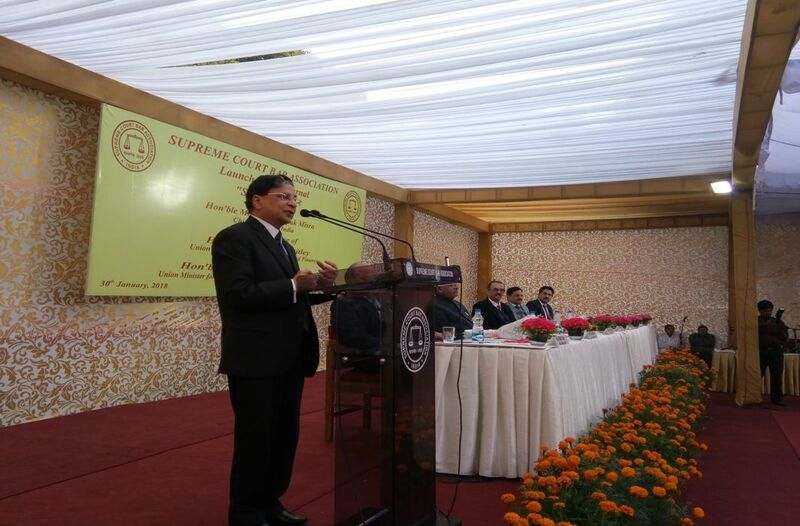 Ten judges of the Supreme Court participated in the programme. The event was organized by the Supreme Court Bar Association.